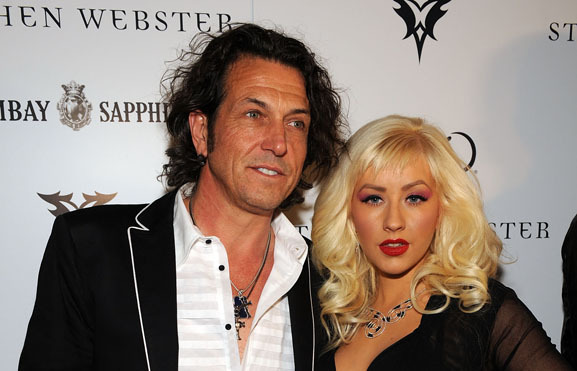 Stephen Webster and Christina Aguilera at Tao, Las Vegas in 2009. Webster worked for a small, independent jeweler in Canada after completing his training and later moved to Santa Barbara to become the head designer for a custom jewelry firm, where he won numerous design awards and began to build a reputation as an innovative and original jeweler. He returned to London in 1998 to open his own studio, the company known today as Stephen Webster Ltd. It is one of the largest jewelry design and manufacturing studios in London’s West End, producing his designs for 120 specialty stores and jewelry salons around the world, including Bergdorf-Goodman, Neiman-Marcus and Harrods. In 2009, Webster opened his own boutique on Mount Street in London’s elegant Mayfair district; a store in Marbella, Spain soon followed. He has plans to open an additional shop in Tallinn, Estonia. Webster’s designs are bold and surprising. He works mostly in 18-karat gold, but he has begun experimenting with palladium, a white metal closely related to platinum, and titanium, a lightweight, high-tech industrial metal. “Both have their difficulties, but ultimately, they have qualities that gold does not,” he says. Webster outside the Marbella store, Spain. He is equally willing to take creative risks with stones. Over the past twenty years, he has developed his own techniques and cuts, the likes of which had never been seen before. He travels extensively to find inspiration and rare stones for each new collection. His latest collection is called “Jewels Verne” and features vintage-looking, silvery diamonds Webster found in India. They were perfect for the dreamy, aquatic mood of his new designs. “All of my work is a reflection of my personality,” says Webster. “I am fortunate that, selfishly, I have pursued topics and inspirations from my life’s experiences and translated them into our many collections.” Those inspirations have included motorcycles, tattoos, the sea, broken glass, architecture, fish bones, rose bushes and film noir, as well as traditional jewelry design and gemstones themselves. His Rayman collection for men featured sterling silver or gold textured to mimic shagreen, the pebble-textured leather made from the skin of stingrays. Other collections have included Poison Ivy, Fly by Night, and Rose and Thorn. Stephen Webster’s most famous collection, however, remains Crystal Haze, which features large, sculpted rock crystal gems layered over thin slices of colored stones like black hematite, turquoise, orange carnelian or pink rhodochrosite. Light and shadows are reflected in the gems, and the effect is mystical and mesmerizing. Crystal Haze was the first Stephen Webster collection to attract fashion editors and fashionistas alike, and it remains in demand today. “It’s what put us on the map!” he remembers. Almost from the beginning, Stephen Webster’s designs have been popular with celebrities, and he began at the very top: Dame Elizabeth Taylor, Hollywood icon and legendary jewelry collector, was his first celebrity client. Other glamorous women and dashing men have become clients as well. Model Kate Moss and movie stars Cameron Diaz, Sharon Stone, Johnny Depp and Jennifer Lopez all wear Stephen Webster, along with musicians Michael Stipe, Jay Z and Sir Elton John. Singer Christina Aguilera recently became the “face” of the company, and Webster designed Madonna’s ring for her wedding to director Guy Ritchie, although the jeweler disavows any responsibility for the union’s outcome. Webster has won countless international awards for his spectacular designs, including “Jewelry Designer of the Year” in the UK, and DeBeers’ “Diamonds Today” prize. In 2008, he was named creative director of Garrard, the world’s oldest jewelry house. For all his edgy elegance and transgressive taste, Stephen Webster upholds the great tradition of fine jewelry with his artistic designs and exquisite craftsmanship, bringing a completely contemporary point of view to the venerable art. Whether designing for his own company or infusing fresh energy into the 275-year-old Garrard, Stephen Webster will continue to push the boundaries of the jeweler’s art. He recently returned from Istanbul and plans to bring the influences of Byzantine art and the Ottoman Empire into future designs. Images courtesy of Stephen Webster.